I had a fun day day scrapping today! 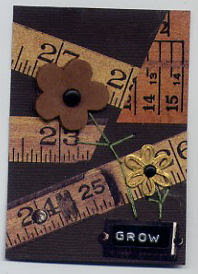 I made 8 ATCs for a swap then after I finished those I decided to play a little more. I have had these ruler sticker forever...one of those things I bought but not really sure why so I wanted them out of here...so I used everything left on the sheet and wouldn't you know that when I was putting stuff away I found ANOTHER unopened package. I really like the way they tuned out so maybe I will use the other package soon. All the charms came from ACP, I hand stitched the flower stems.